Our foot mask aims to care for your feet, keep them young and smooth. Try it. Multifunctional: whitening, moisturizing, rejuvenation, anti-wrinkle. Improve the foot dry, achieve skin smooth and delicate soft skin. 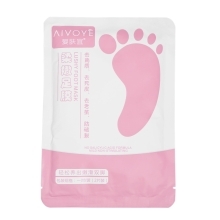 Foot Mask takes care of dry and rough foot intensively. 1 pair inside, disposable design, hygienic to use. Natural ingredients, has no harm to your body.